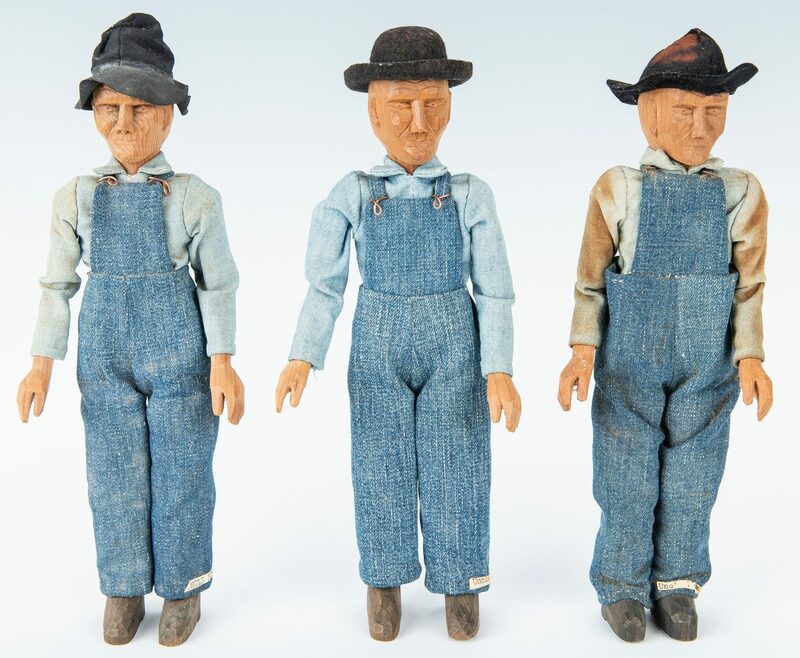 Attributed to Pauline (Polly) Page (Pleasant Hill, Tennessee, born 1918), 5 vintage "Mountain Men and Women" folk art dolls, plus 1 "Acadian Handcraft" labeled Doll. 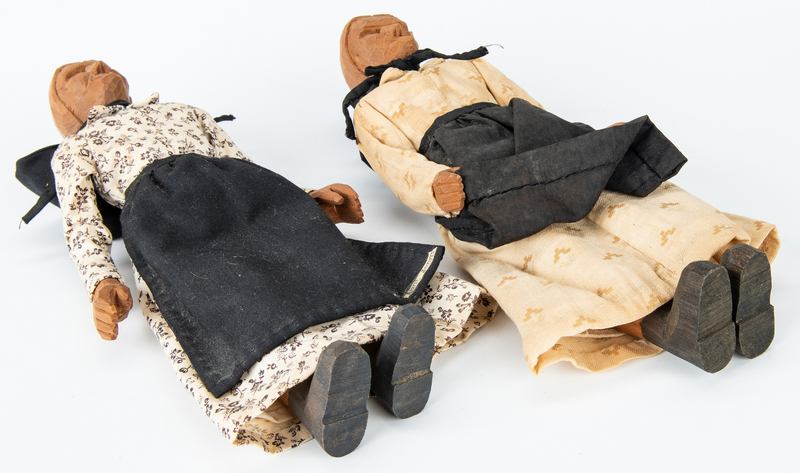 1st-5th items: Five (5) dolls attributed to Polly Page, with hand carved wooden faces and bodies, wearing cotton clothing. 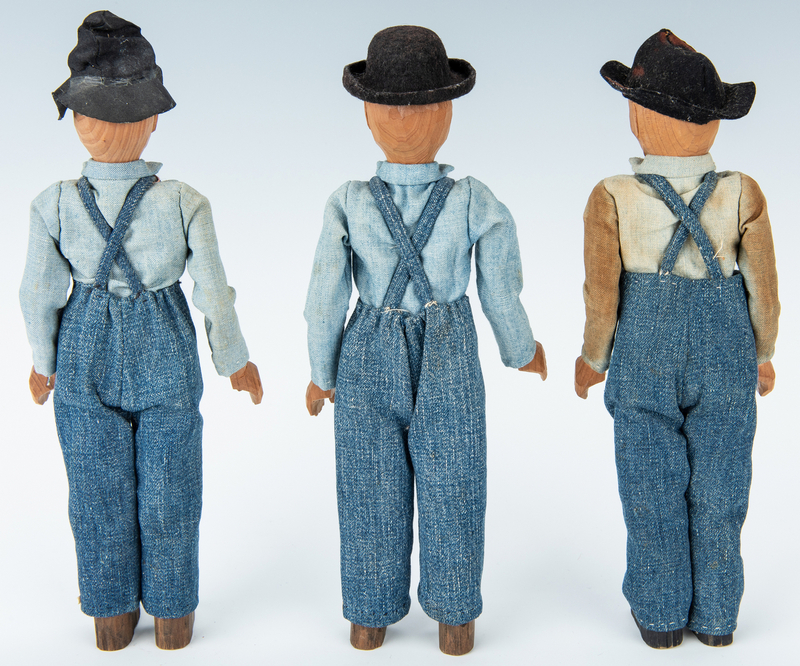 Includes three identical male figures labeled "Uncle Pink", each with overalls and hat; and two female dolls each with apron and bonnet (one labeled Aunt Jenny, the other not labeled). 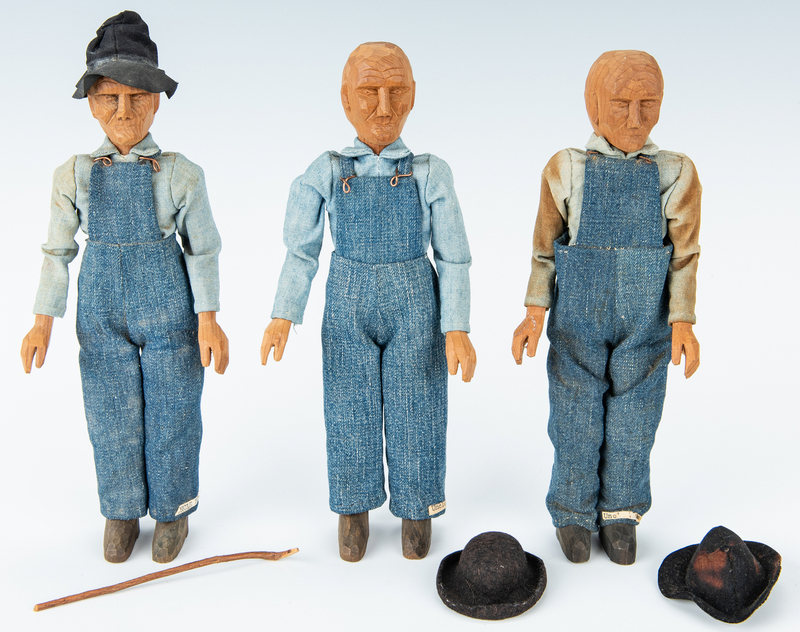 All approximately 10"H. 1 carved wooden cane included. Circa 1950s. Provenance: Nashville, TN estate. 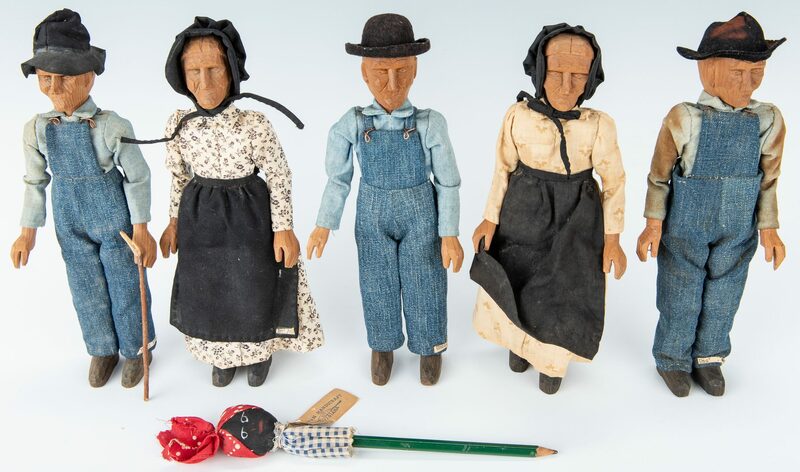 Biography (from the Tennessee Arts Commission website): "In her long career as a woodcarver, Polly Page has preserved the legacy of Cumberland County's Pleasant Hill Academy, one of Tennessee's most notable Appalachian settlement schools. Part of a wider education and social reform movement in isolated areas of the southern mountains, the school also had programs encouraging student involvement in traditional arts and crafts. 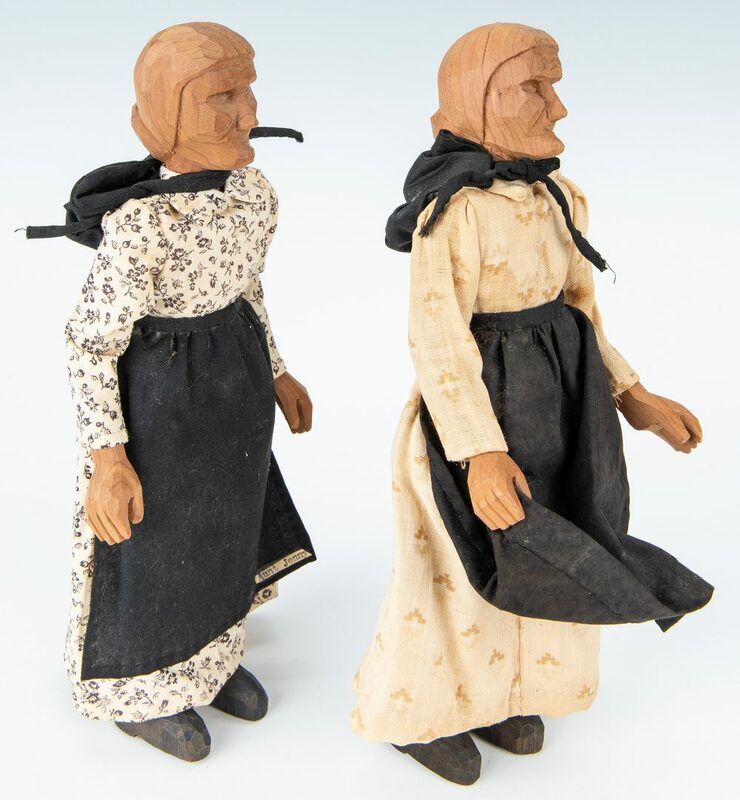 Polly enrolled there in 1929 and soon became the star pupil of carving teacher Margaret Campbell, mastering many human and animal figures. 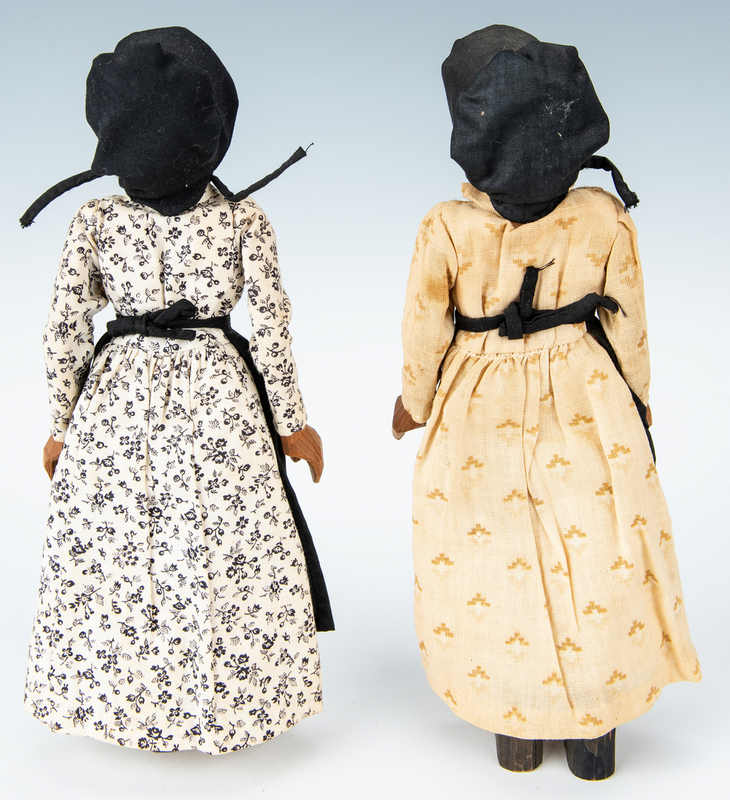 She developed her own signature character dolls, "Hitty" and "Aunt Jenny and Uncle Pink", based on people in the community. 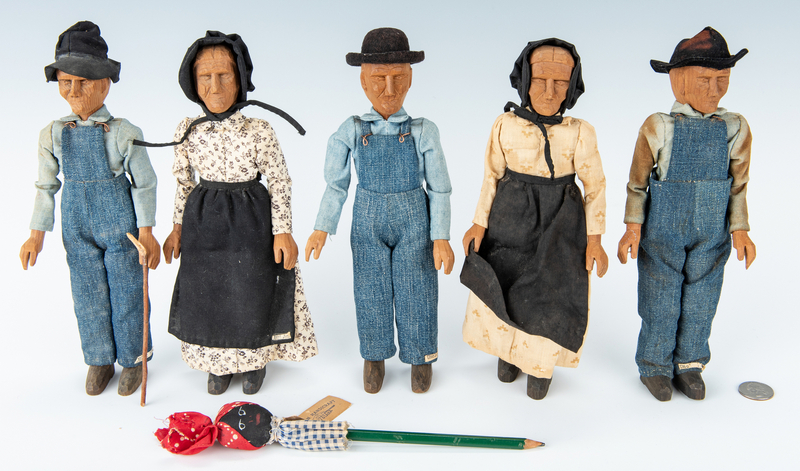 When the academy closed in the 1940's, Polly became a leader and teacher in the Pleasant Hill Community Crafts program that succeeded it. 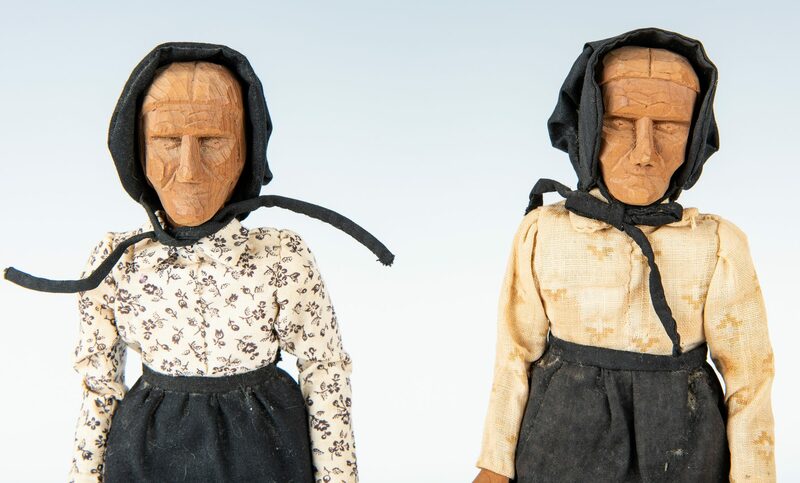 She carved nonstop throughout the years and gained a wide reputation, starting her own Polly Page Craft Center in the 1970's, where she hosts visitors and customers. Polly inspired Jane Fonda's title character in the 1981 film "The Dollmaker." 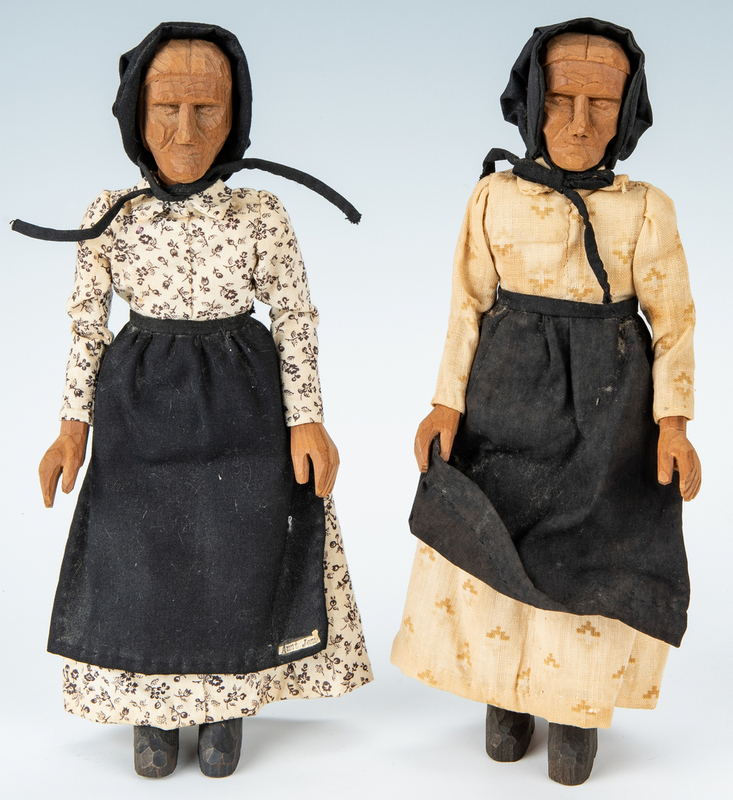 Page received the Governor's Award for Folklife Heritage in 2013, and her dolls have been exhibited at the Tennessee Executive Residence. 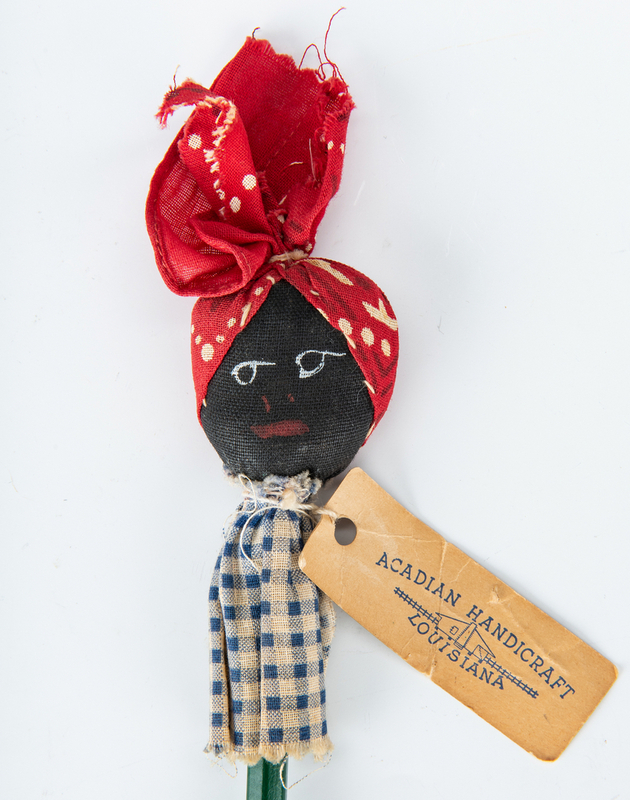 6th item: Acadian Handcraft Louisiana doll made from pencil and stuffed sewn cotton, the face painted to represent an African American face. Retains original paper label. 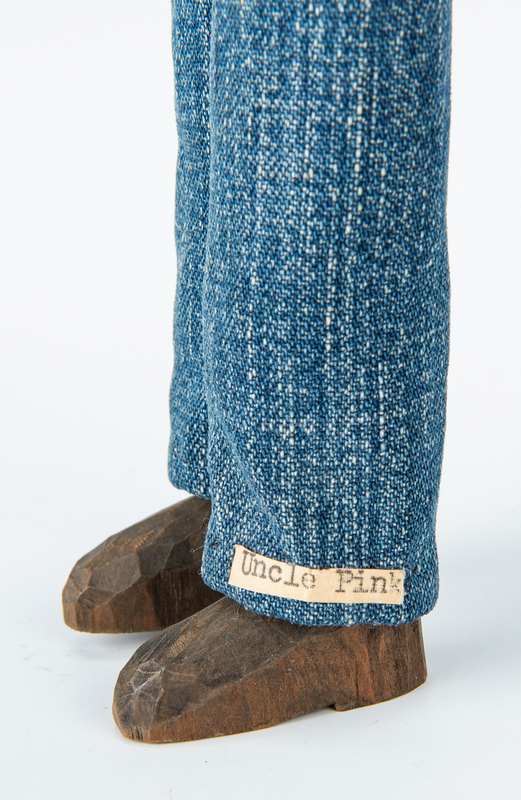 8 3/4"L. CONDITION: 1 Uncle Pink doll has staining to arm, name label partially worn off, 1 Uncle Pink doll with some discoloration to upper sleeves. Other dolls very good condition. 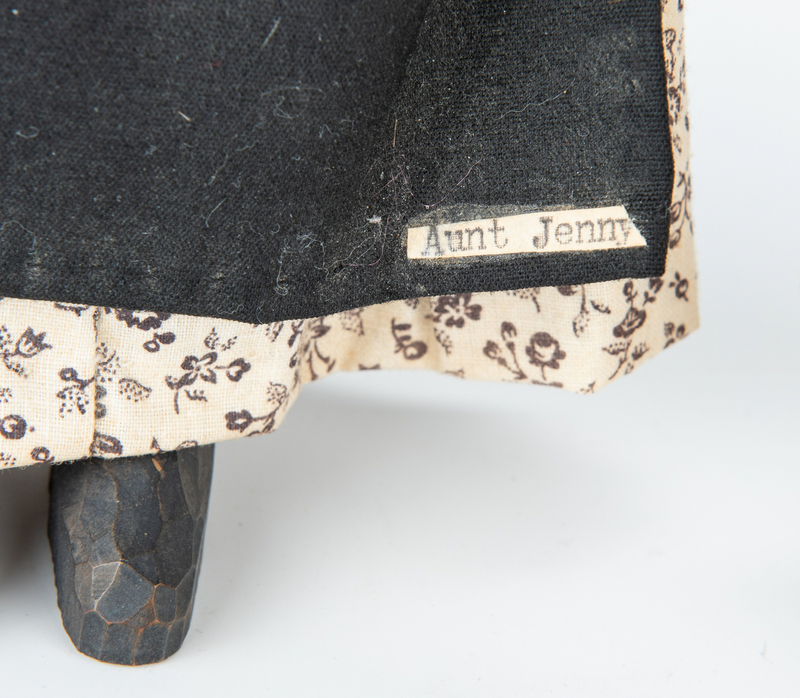 Acadian Handcraft doll label is creased.